One of the most exciting spectacles in Major League Baseball, or baseball at any level for that matter, is seeing home runs in sequence. “Back-to-back” is a term we like to use to describe two consecutive hitters “taking a pitcher deep,” another one of baseball’s famous catchphrases. However, something that is much more exciting is going “back-to-back-to-back.” In poker, three of a kind trumps a pair. The same applies to home runs hit in succession in baseball. Going back-to-back-to-back is rare. It’s happened fewer than 25 times in the history of Major League Baseball. The San Diego Padres claimed their place in history by achieving this rare feat. However, the Padres’ instance going back-to-back-to-back is unique. What separates San Diego from the other teams who have done this, is that the Padres made it happen during the first inning on opening day. Opening Day at Jack Murphy Stadium in 1987 fell on April 14. The Padres played a game against the San Francisco Giants. Opening Day carries its blend of excitement. We baseball fans all know that waiting for Opening Day feels like waiting for Christmas, and takes just as long, if not longer. And, like a kid struggling to sleep the night before Christmas, we fans have trouble sleeping on that Sunday night before our teams’ first game of the year. 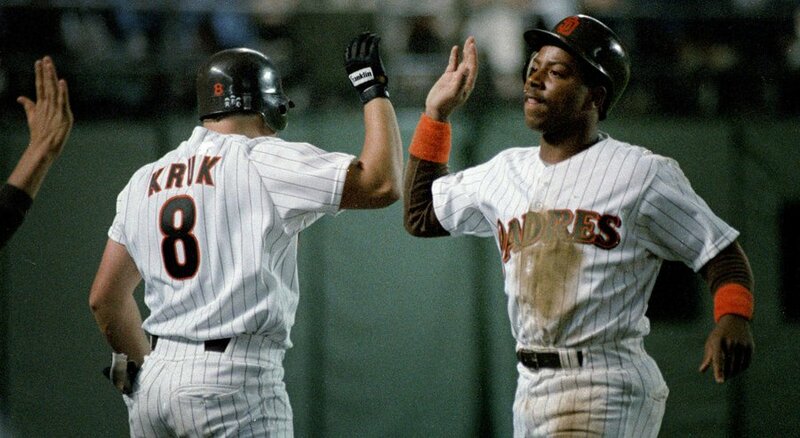 The three players who hit the home runs in succession that day were Marvell Wynne, Tony Gwynn, and John Kruk. Andy Hawkins made the start on the mound for San Diego and gave up two runs in the top of the first inning. Hawkins got out of that first inning, and then it was the Padres’ turn to try to get runners around and across the plate. Wynne led off. He wasn’t originally meant to start that day. The leadoff spot was supposed to belong to Stan Jefferson, but Jefferson suffered from a sore ankle before the game began, and Wynne was penciled in to take his place. After working a full count, Wynne sent the next pitch from Giants starter, Roger Mason, over the wall in right field. The Giants’ lead was cut in half. Next to the plate was Gwynn. With a 1-1 count, Gwynn swung at the next pitch and it went to deep right center, clearing the fence for the second home run in the inning. The game was tied 2-2. Kruk was the third hitter in the inning. He, too, had a 1-1 count before hitting Mason’s pitch. It left the ballpark after clearing the wall in left-center field. The Padres had a 3-2 lead. 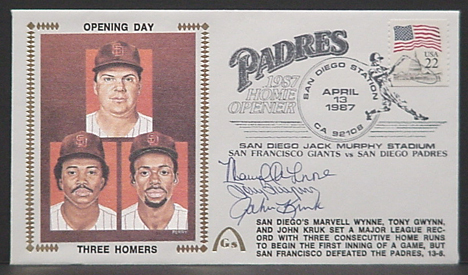 San Diego came close to drawing a “four-of-a-kind.” Garvey was after Kruk in the lineup, and he hit a pitch deep into center field, but it was caught by Chili Davis. That lead didn’t last long, and the Padres lost that game 13-6, but the team still pulled off one of the most memorable feats in baseball. This was the second time San Diego went back-to-back-to-back. Jerry Turner, Dave Winfield, and Gene Tenace did it in 1979, but Wynne, Gwynn, and Kruk were the only players to do it in the first inning. As big as this was, the Padres organization rarely mentions it…. ever. Teams around Major League Baseball celebrate their history, no matter how big or small it is. The San Diego Padres should also do this. It would be interesting to see how many Padres fans know about this moment. The organization needs to promote these things. These memories are unique and should be treated as such. Embrace the history of this club, and celebrate it.